Hi Everyone! Wow, it’s been a crazy couple a weeks. 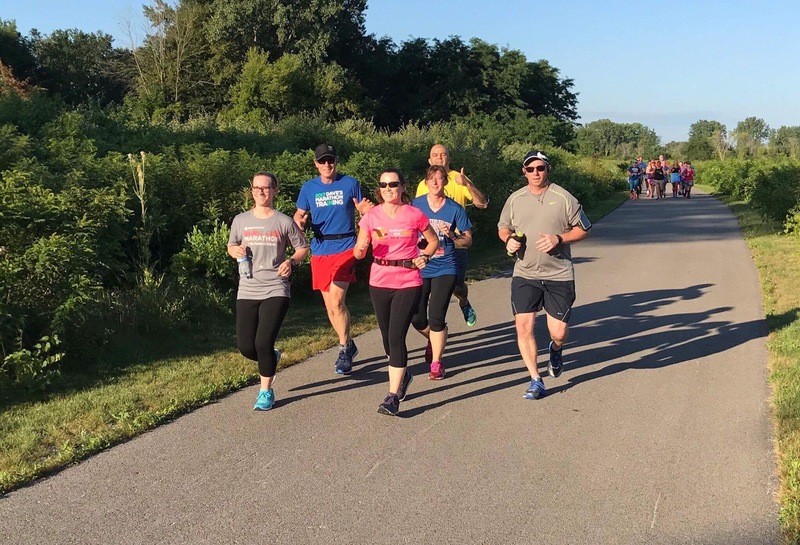 Our Dave’s Running PR5K Training program that I was a Coach for and the Dave’s Running Fall Marathon In Training (MIT) program that I am also coaching, had a 1-week overlap. So week-1 of the of MIT was kind of a blur. LOL. Part of our group getting ready for a long run. But on Saturday, the 29th of July, I finished coaching my PR5K Group with the running of the Tiger Town 5k Race and on Sunday July 30th I was able to meet and run with my Fall MIT group. What a great group! A few of my 2017 Fall MIT group on a long run! So what is MIT? The Fall MIT program is a 12 or 16 week Half or Full Marathon Training program. Like the PR5K program, the runners self-seat themselves into one of 10 different Pace Groups. I am Coaching the 4:15 – 4:24 Full Marathon pace group and my Co-Coach Chris P, is Coaching the 2:07 – 2:12 Half Marathon pace group. We both run the same paces, but the Full’s just run more miles in a typical work out (see below). The primary program is 12-weeks and is designed to prepare the runners for either the Detroit or Columbus Half or Full Marathon. The program then continues on for 4 more weeks to allow runners to prepare for the Churchill’s Half Marathon, which is a local race in mid November. Below is the work out for the first two weeks. As you can see, the program lays out a 7-day training plan and this is supported by two Coach Lead Workouts a week on Wednesdays evenings and Saturday mornings. There is a line for each of the three programs. HM = 12 Week Half Marathon, C = 16 Week Half Marathon for Churchill’s and the M = Full Marathon. So my goal is to offer up a short recap for each week, but like I said, its been a busy two weeks and I needed to cover some of the basics of the program. Now onward and upward! Yea!! So the biggest question we always get is “What Pace group should I run with?”. To help reduce this stress, on Wednesday of week-1, we have our runners run what we call a “Time Trial”. After a 1-mile warm up, we have them run 2 miles (timed) at their 5K pace. This allows us to give some guidance on what group they should start with. This went very well and most picked a group to at least start with. 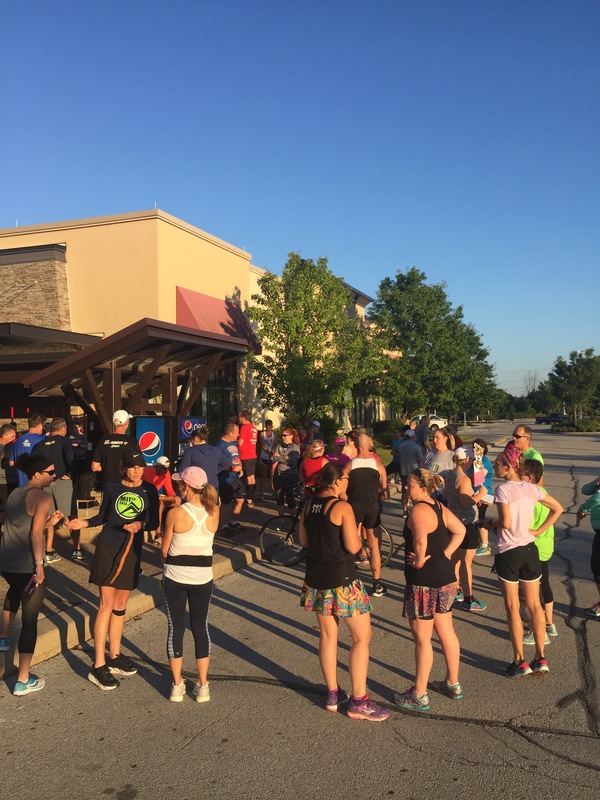 Usually on Saturday mornings we run our “long run” for the week, but because of the PR5k program, we had to move it to Sunday this week. Ugh!! So at o-dark-thrirty, we met our group at Sidecut Metro park, and the Half’s ran 6-miles and the Full’s ran 8-miles. Overall, it was a typical first week, busy, some apprehension and a Ton of stress. Week two will get better. Wednesday is reserved for our “Speed Work”. Week-2 brought Fartlek’s. Ha Ha, yea that’s a real thing, not just a fun thing to say! Fartlek is a Swedish term for “Speed Play”. The Fartlek workout prepares the runners to handle the uneven pace of a race. In a race, a runner usually runs fast, then shower, then fast again. This variation in pace could be due to the race course’s terrain, surges or congestion by other competitors. Ya know, basically like driving through a construction zone! Our workout called for a 1-mile warm up, then we ran 6-sets (for the half’s) and 7-sets (for the Full’s) of 3-minutes “ON” and 1-minute of “OFF”. The difficult thing to explain to everyone is that there is No set pace for the “ON” segment. You just need to run hard, then back off and run slower, then back On, etc. While we did meet at a local track, Coach Chris and I dicited, as did many other coaches, to take our group “off track”. Good thing, as you will find out, I hate running on a track! Give me sidewalks, a bike trail or even a quite street to run on and I’m a Happy Runner! So we ran across the street to shopping / light industrial center, made a lap around and headed back. Saturday we had 7-miles for the Half’s and 9-miles for the Full’s at “Easy” pace on the agenda. I will chat more about Easy Pace next week. We had to change our meeting point this week because the Park Service complained that our group of 200+ runners totally took over the park and there was no parking left of the general public. Yea! Love that our program is growing each year! We met at Fallen Timbers, a shopping complex adjacent to our park and there are trails to allow us to to access the park. Ah Yea, almost forgot! Every MIT session, the Pace Groups pick a name for their group. Bob, one of our head Cosches, always gives us a Theme. In the past I’ve been on the “Sole Mates” team when the theme was Running Friends. I was on “Jamaican Me Crazy”, when the theme was “spring break”. This session, the theme is “spirit animal”. So after much deliberation on our second long run, seriously, some of the things we talk about on long runs, am I right runners? Anyways, we are to be ever known, at least until the next MIT program, as “The Speedy Sloths”. Until we meet again …. happy Running. Ever had to pick out a name for your running group? Drop a comment, I’d love to hear from you. Oh, yea, be sure to “click” on the Folow button as well. Next Post: Run Toledo Ambassadorship! Listen, the track is painful, I understand that, but for my 400m and 800m repeats, I need the track. While I enjoy the treadmill also, the track makes me work much harder at keeper the pace where I want it to be. Track Tuesday is always my most challenging day of the week. Haven’t run in a group except as part of a relay so no, not really. One day my schedule will allow me to join MIT! COLD WEATHER ALL THE WAY! Forget this hot stuff. Bring on the 40 degree weather!!! Yea, 40 degrees!!! Don;t get me wrong, Speed Work is very important and I love it, jut not on a track. Hate the roundy round. But that’s just me. I’m exhausted just reading all that! So for the pace groups, do you find during the course of training that people shift into different groups depending how their training is going? I love that you use a time trial. It’s also really nice to have the half and full marathon groups running together, but on different plans. I have to say, I’m pretty impressed that you guys have race specific plans. So how do you select the races? Is it by date, or overall popularity among the group? I have many questions because I have never trained with other people so this is all quite fascinating to me. Yes, people do bump up or down to different groups sometimes. It’s nice that we have that option. We run two different MIT programs a year. The Spring session is 16 weeks and focuses on a local Full Marathon, the Glass City Marathon, which is a BQ race. For the Fall MIT program we just offer a 12 and 16 week program and the runners pick their races. We also offer a 1/2 marathon at week 6 of our program. Most use it as a long run that week, some race it as a gauge to see where they are at half way through.